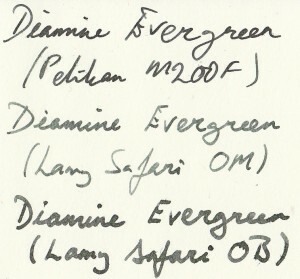 I’ve mentioned Diamine Evergreen before, but it was generally in comparison to other inks — not a “review” as such. 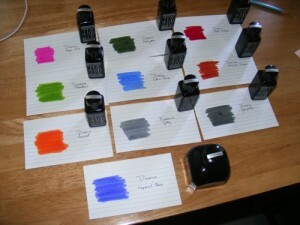 Let me explain why I’m revisiting my ink collection. 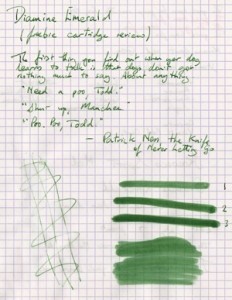 I recently had an epiphany that dark greens, greys and blacks are my go-to colours for note taking. I have plenty of other colours — from nice bright ones to fairly traditional colours. But I’ve now settled on colours I will regularly use, and the others have been tucked away in a little box under my shelves. 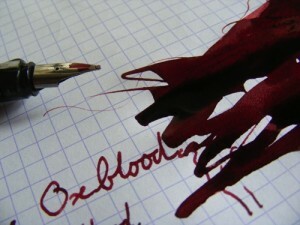 Cleaning: does the ink hang around or does it go after a few flushes? 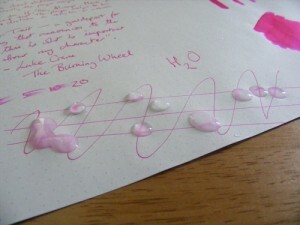 Water resistance: if I spill my water glass, are my notes gone? 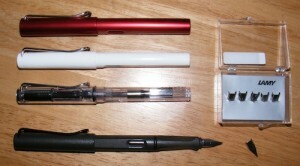 These are my “workhorse” pens, each with their own issues. 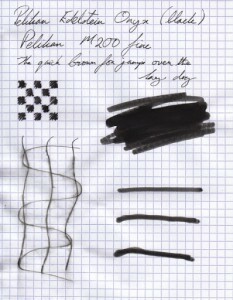 The Pelikan and the broad Lamy can be hard starting with some inks and papers, and the Lamy Broad can also really drag on paper without lubrication. 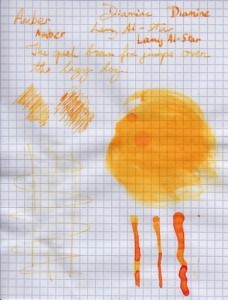 The Lamy Medium is much drier than the others, and really shows up some inks. 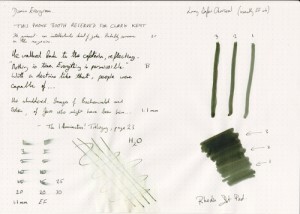 As noted before this ink changes colour over 24 hours from a sort of blue/green-black to a proper evergreen — the scans are of the final colour (top) and just-dried (bottom). 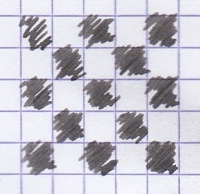 The Clairfontaine paper can drag a bit, and the glossy surface can punish hard starters. I had neither problem with Evergreen. Printer paper feathers more but still no bleeding. 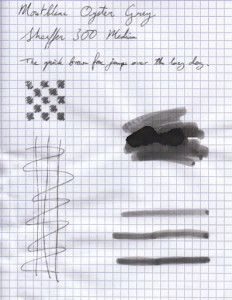 Filofax flex cream paper is for a bit of fun — it shows. 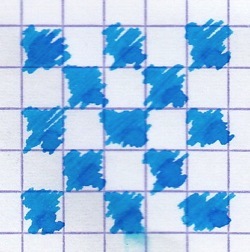 The ink looks like teal, verdigris or blue-black on this paper. Suspect it would do the same with other cream papers. All in all pretty good. I think the ink looks best on white paper, and for cream I’d choose a proper grey like Diamine Grey. Doesn’t really bleed through any papers I tried, though threatens to with the fat Safari nib on printer paper. 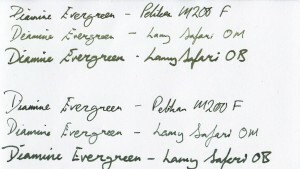 Feathers a bit with the Safari nibs on cheaper paper, but the Pelikan is very well behaved. Shows through a bit on thinner paper, but doesn’t affect legibility. 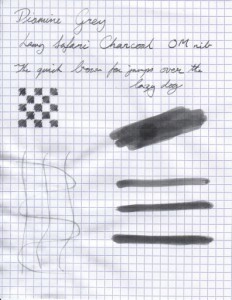 I’ve also used the Charcoal Lamy with Field Notes which tend to be hit and miss with fountain pens. 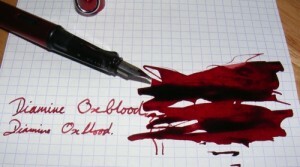 With this ink everything is legible, no bleeding, feathering or show through. 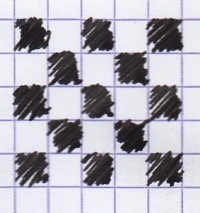 The line from the Pelikan is a little tidier, so I think that’s an effect of the nib, not the ink. Great. A real pleasure to write with. The fat Lamy OB glides over papers. 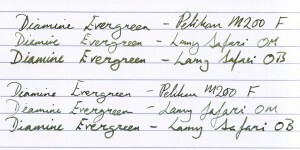 Pretty much a benchmark fountain pen experience, even with the dry Lamy. Good luck with that. 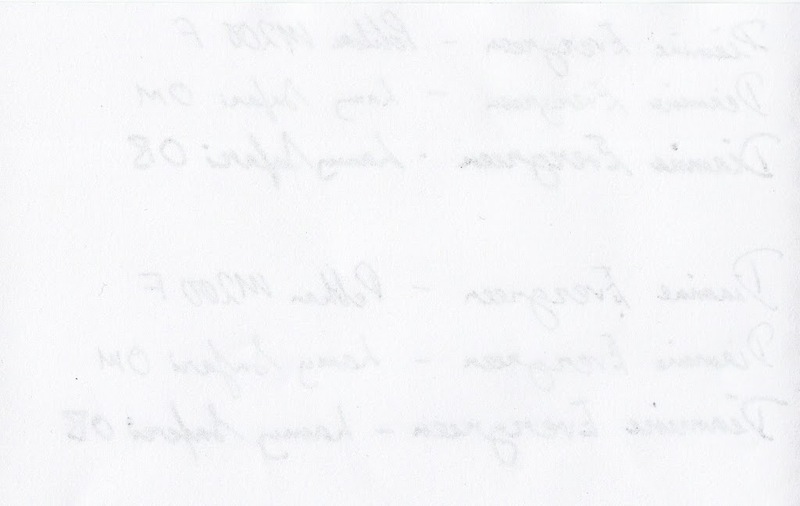 If this ink left the tiniest residue I’d be happy, but any kind of soaking will make writing illegible. Great, cleans up quickly, doesn’t hang around (er, see above). 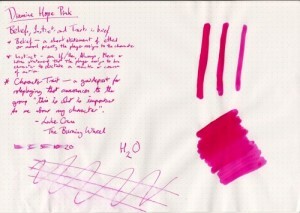 This ink ticks a lot of boxes for me, both colour-wise and with performance. 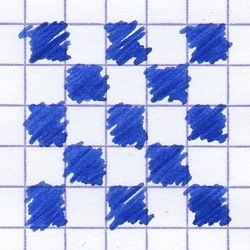 Works in several different pens, on several different papers, and colour is to my liking in all cases. 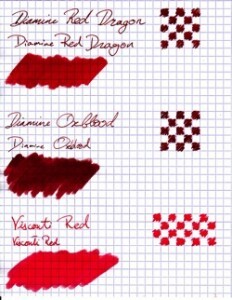 This is pretty much the benchmark I would use to compare other inks. Not all inks I have (Diamine and other manufacturers) are as lubricating, or easy to clean, or look good both wet and dry. However, there is no water resistance. That’s a lower priority for me than the actual writing experience and my ability to read notes I made a few days ago (anything important gets transcribed). 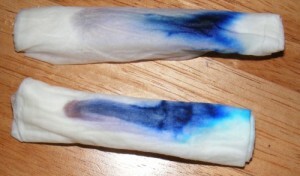 Both blues appear to be a fairly “true blue” with no green or red leanings, though from the chromatograms (Deep Dark Blue on the bottom) they have a grey undertone. I don’t know if the separation with the bottom ink is better because of the ink or because I put too much on the top sample. Mostly I like turquoise for annotation with a very fine nib, and the lamy turquoise is a bit too light for writing with a fat nib. 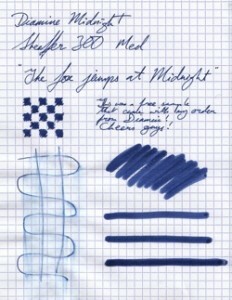 I’d choose the SSB for all-round use although Waterman changed the name to Inspired Blue and I’m not 100% the inks are exactly the same. Some say it’s just marketing, others suggest there may be a difference. I got a genuine NOS bottle of SSB because it was cheap and I like the old label better than the new with its French name (Encre Bleu des Mers du Sud). 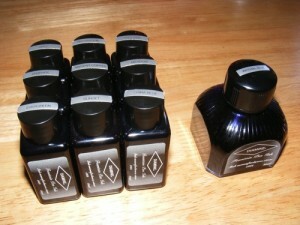 So, two sets of two inks, very similar. Just like the greys and the reds most people are unlikely to care about the differences. I’ve also heard people say that of all the colours turquoise is the most similar between brands. It’s just… turquoise. You either want a nice vibrant blue or you don’t. But whatever you choose I’m pleased to say these are all nice safe inks, flowing and lubricating well with easy clean up. 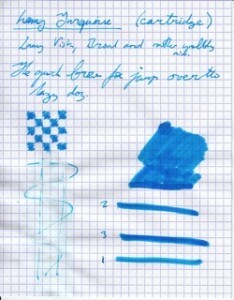 The Diamine colours are very wet, Lamy is a little dry and Waterman is “just right”. The one on the left is dry, but recently written. The one on the left has been sitting for 24 hours. Granted, the white balance is different in the two scans (no idea why, they were done back to back on the same settings) but trust me, the colour does change from a fairly bright true blue to a nice milky blue. 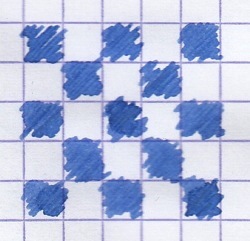 Not great for writing notes as the contrast goes down, but looks pleasant nonetheless. Nice, eh? This colour is very popular, flows really well and is also easy to clean up. Terry Pratchett’s Pyramids came earlier in my reading than Gene Wolfe’s Book of the New Sun, but if I had to pick a name for a new shade of black ink I’d choose fuligin. I’ve tried to show them in order of dark to light, but it’s not easy to compare. 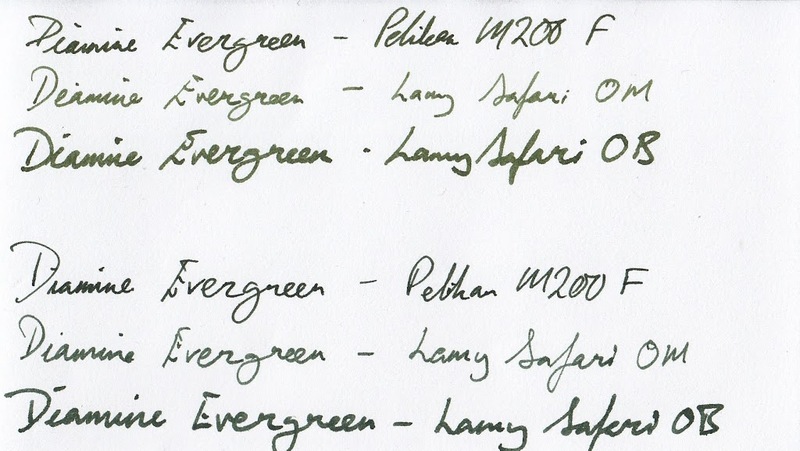 Also inks behave differently in different pens, and the Parker 51 was writing a bit dry (I later cleaned it extensively — there must have been some ink clogs because it’s wetter now). p>Both the Diamine and Montblanc greys are a bit dry; the other two feel lovely to write with, lubricate well and flow nicely. 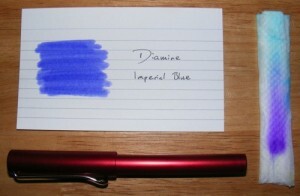 Much as I like the Montblanc for colour and funky bottle, it’s more than twice the price of the Diamine inks. The Graphite stands out for colour, although the greys will look better on cream paper. They all have a fair amount of water resistance, but the Graphite is really obviously green when wet. 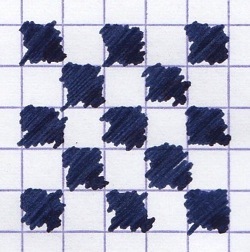 I learned a lesson that just mixing in “a bit of black” can cause problems due to blacks interacting with each other. 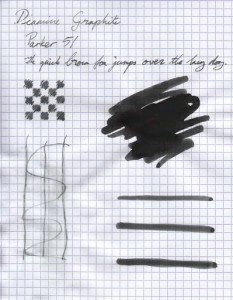 In my case, some skrip black I used to darken a mixture with some Onyx and some brown caused precipitation — which I only noticed after having used a pen for a while. 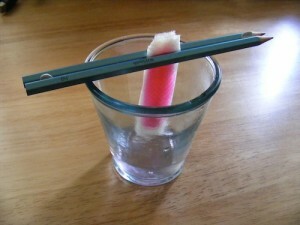 Took a lot of soaking and flushing to make the pen write properly again. You might not be able to see well but the colour left behind in Meadow (left) is blue, and the rest is a sort of Kelly Green. Vert Olive leaves a grey colour behind, and Amber doesn’t leave much behind at all (as apparent by the water resistance test). This wasn’t the olive colour I’d been looking for, but I was pleasantly surprised. My amateur colour chromatogram showed a fairly pure blue and yellow. 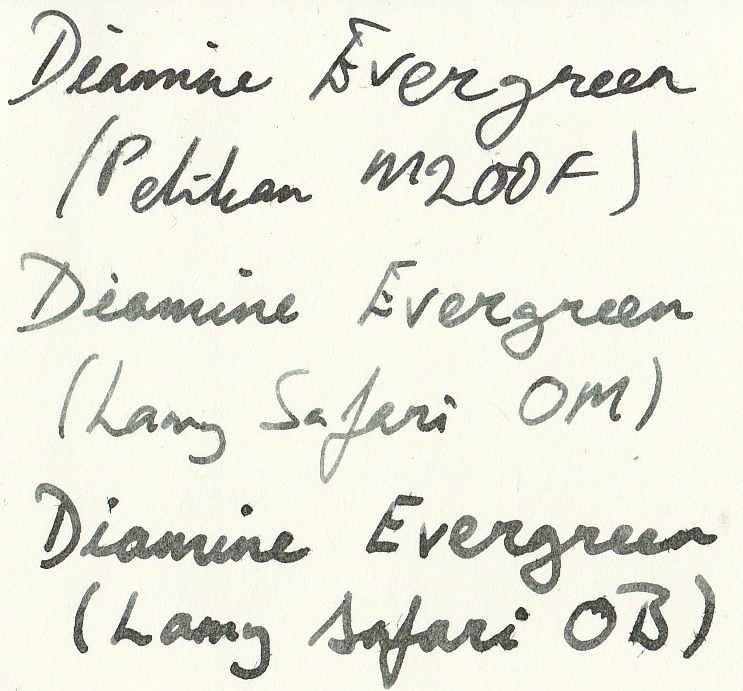 The nice people at Diamine slipped some free cartridges in my parcel, so I also got to try out Emerald, and will be trying Midnight and Chocolate in the future. Mmm… shades of purple and turquoise. Interesting. Overall neither inks are particularly water resistant. But they’re nice inks, not the confrontational sort of green favoured by Outraged of Chiddingstone. 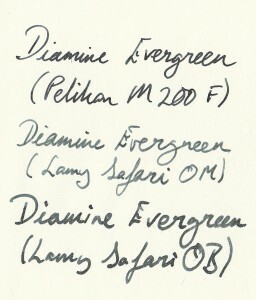 Evergreen shows very good contrast on white paper, and Emerald shades nicely. 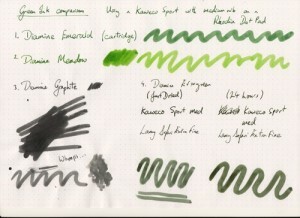 That’s Emerald, Meadow, Graphite and Evergreen together. The interesting thing is that Evergreen goes through a colour change over 24 hours, losing a lot of its blue. Just written on the left, 24 hrs dry on the right. Not a subtle change with the swabs but if you’re writing a fine line it will look grey-black immediately but the green will come through later when you go back to your notes. The other two I compared are Graphite and Meadow. 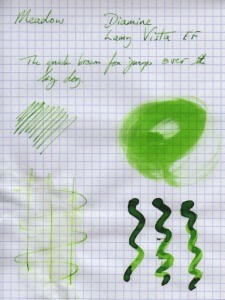 The former is a grey ink but it has a very strong green undertone and it shades a bit–probably about as exciting as grey-black ink gets. Meadow is the colour of grass, but not quite as yellow as some of their other offerings. I don’t care for the swabs but the actual writing is quite nice with a wet writer. It works for annotations and hilighting. This was an impulse buy, but has turned out to be a surprise performer. A bit loud for everyday writing but great for annotation/hilighting. I probably have all the pink I need in my bottle, but I’m really taken with this colour. It’s moderaly drip resistant (due to the pink hanging around for ages) and flows very nicely. Brown inks are never as interesting as I expect them to be. 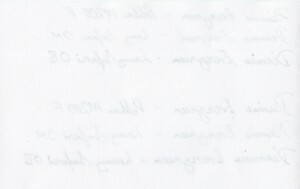 Maybe I’m hoping that they’ll turn my messy scrawl into a romantic sepia-tinted document. They don’t. 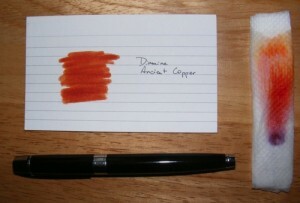 Diamine Ancient Copper can look so-so or it can do spectacularly well, shading nicely. It looks lovely in the bottle. 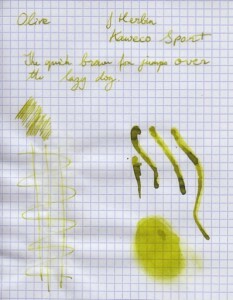 It deposits crud on certain nibs (Lamy Vista yes, but my Sheaffer hasn’t been a problem). The chromatogram leans strongly towards orange, but there’s some purple at the base of the ink–who knew? Apologies if the photo isn’t up to scratch, that dark spot at the bottom really does look purple. Would I buy a big bottle of this ink? Unlikely. 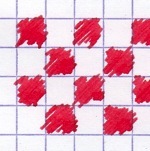 It’s a novelty; it’s OK for making a day’s notes or addressing cards. I wouldn’t write a letter with it. Still, I’m drawn back to it. I reckon I’ll be writing with it tomorrow. The notes I made with it are very easy on the eye. Best with a white paper (cream is makes it look to orange). The swab above makes it look like a boring orange-brown, the truth is it’s both orange and brown. Honestly, it’s probably as exciting as brown is going to get. I guess it oxidises and darkens in air. 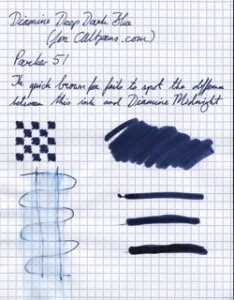 Richard Binder says nice things about Diamine ink–according to him it’s as trouble free as Waterman ink (mostly, but not entirely my experience–see below), and unlike Waterman it comes in a hundred colours. Diamine ink isn’t expensive, either. A big 80ml glass bottle comes in at around 6 quid and you can buy smaller plastic 30ml vials for proportionally less–mostly you have to get these from the Diamine website, which doesn’t play nicely with any Mac browser. Delivery is fast, at least–I ordered 8 new colours and received the package the next morning. Over the next few posts I’m going to look at ten different colours of diamine ink, do some writing samples, swabs and chromatography. the necks aren’t very wide, so (a) fat pens may have trouble and (b) when you do fill for the first time it’s easy to dispace the ink and make a mess on the desk. The plan is to test these with swabs, writing samples and some improvised paper chromatography. 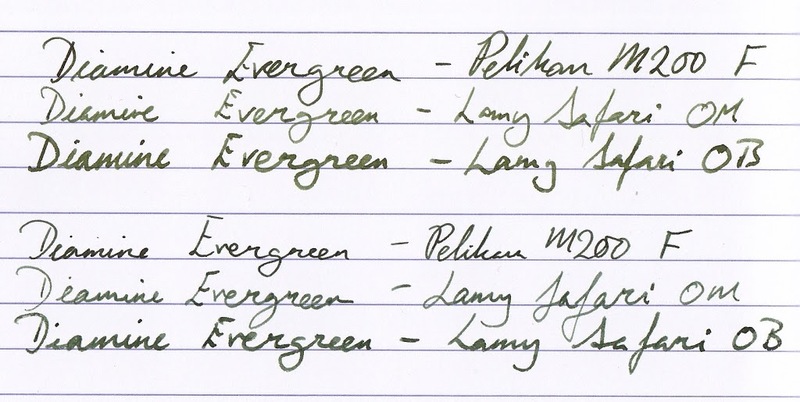 Lamy pens are pretty good for this given the way nibs can be exchanged–the 1.1mm nibs write fairly dry, whereas the broad nib I have is very wet. 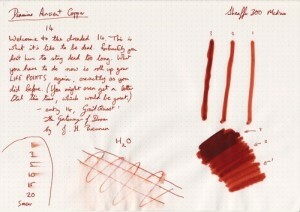 Glenn’s Pens has a big section on ink, with comments on how representative the different samples are. 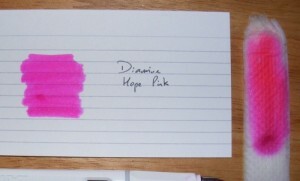 I think the site’s a little out of date since it mentions the representativeness of the colour swatch on the Diamine site. 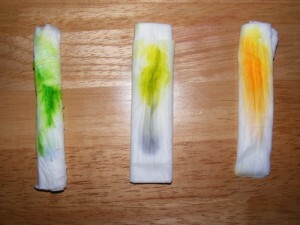 I believe the site must have changed since, as you now get swabs which look closer to the true colour of the ink. 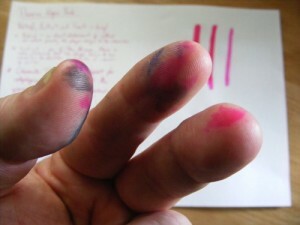 The Writing Desk has its own Colourama, and you can even compare up to 3 inks side by side. I don’t really trust the swab of Imperial blue on this one. The Goulet Pen Company has its own Swab Shop which is very similar to the above, except you can compare up to 5 inks and it’s easier to view by ink brand, too. 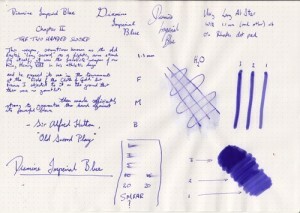 p>Imperial Blue was my first ink from Diamine. 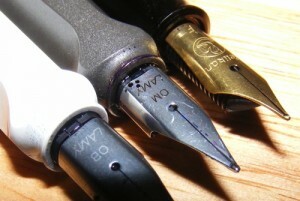 Pen is a Lamy Al-Star with various nibs–mainly a 1.1mm nib which is fairly dry writing. The colour above looks fairly representitive on my monitor, but YMMV. 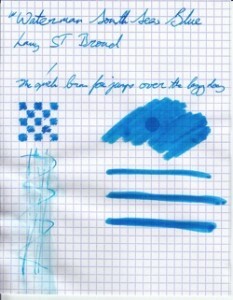 Slow to dry (20s) like all Diamine inks on this paper (Rhodia dot pad, so fairly glossy). 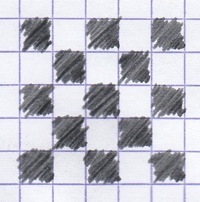 I’m sure it’s better on other papers (e.g. copier, note card, letter paper). Tolerant of a few drips of water, not sure how immersion would affect it. It really looks purple. Trouble is I find blue-purple boring. I’d prefer red-purple almost to the brown end of the spectrum. You can see the blue/turquoise that elutes first, and the purple/pink is left behind. 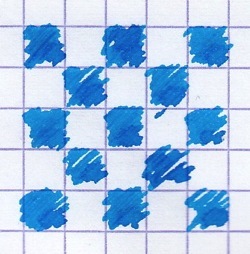 That’s been a consistent pain to flush out of several different pens–the pink hangs around long after the blue has been flushed out. 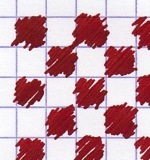 I’m trying to limit any ink with pink/red/purple to just a couple of pens. It looks best on bright white paper (it looks a little strange on cream writing paper). I haven’t written a lot with it lately, and while a whole page looks striking it can be a little intense. 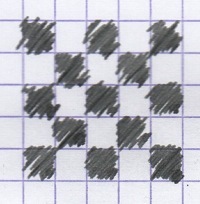 For note-taking I prefer something on the grey-brown side. I wish I’d only bought a small sample; it’s just not for me. 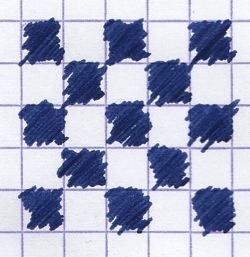 Still, it mixes well with a black Skrip ink to make a sort of indigo/denim colour that’s much easier on the eye.